Amazing to watch how much data technologies and practices have evolved over the last 10-15 years. Despite a myriad of new nosql, big data, self-service BI, data governance, data prep, machine learning, and now artificial intelligence platforms that have come to market over this time frame, the fact is many organizations are still in early stages of maturing modern data management practices. Part of the issue is the technology landscape itself. When you review any one technology, it likely has different capabilities across the data lifecycle. Rarely is a data visualization platform only capable of analytics and visualization and they often comes bundled with some data management and sourcing capabilities. Similarly, there are data prep technologies that do prep but also add elements of data governance and visualization. This along with the myriad of data technologies that are competing for market share and brand awareness makes it very difficult for leaders to navigate a data technology selection processes. Evaluating data tech is far from trivial. I won't rant, but there are many data technologies, in an effort to "check the box" that they have a feature or capability, launch an "MVP" that just isn't good enough. I've reviewed data prep technologies that are worse than spreadsheets, ETL platforms that lack documentation and debugging tools, and data visualization products that only have filters to drill into data. This means that organizations really have to invest in POCs and ideally pilots to fully understand the depth of features each platform offers and whether they meet the needs of the organization. Even with technologies selected, the next challenge is in helping people in the organization learn the new skills to perform data roles and work with new technologies. What's wrong with the picture I just shared. Very simply, it's technology driven. Your first step in digging for oil shouldn't be about what drill you're going to use. You need a strategy, a perspective of organizational strengths, and some knowledge of what types of wells you plan on drilling before selecting your sites and equipment. 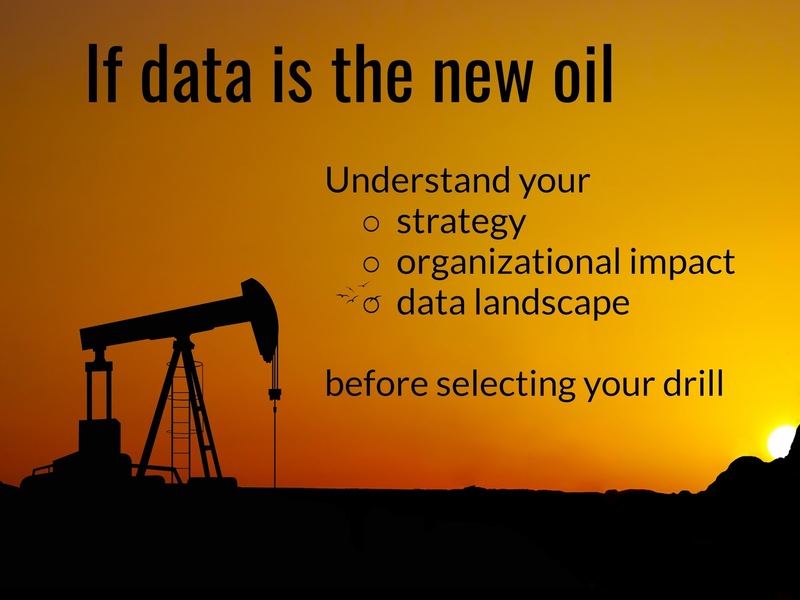 A data strategy helps to align stakeholders on who the target audience is, why analytics is important to them, what values are being addressed and what impact is being targeted. A perspective of organizational strengths helps sorts out new roles and responsibilities that are needed to enable the data driven organization. Identifying what types of data structures, data challenges, and target analytics is then required to zero in on the types of technology capabilities to seek. Want more on these three perspectives? I hope you enjoyed this post, but I have more to offer. 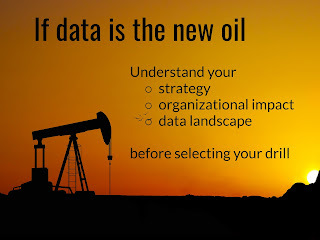 If you subscribe to the free StarCIO Driving Digital Newsletter I will respond with more on defining your data strategy, identifying organizational strengths, and classifying the different types of data problems. This is the fifth article of a multi-part series on What I Learned about Digital Transformation from Speaking to Hundreds of Leaders. You can read the previous articles on "We are more successful onboarding new technology versus maturing it", Financial Practices are Outdated for the Transformation Era - (And here's what you can do about it), Developing a Strategy for Putting People First in Transformation Programs and We are doing agile but are not Agile. The next article on What to do when my CIO still doesn’t “Get It” is now published. Sign up for my newsletter if you would like to be notified when new articles in this series are published.